If you would like to create a lasting memorial for your loved one, Birk Monument of San Angelo, TX can help. Since 1899, we have specialized in cemetery monuments and custom grave markers. 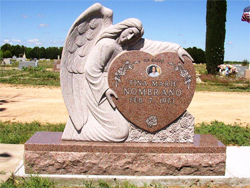 We design and manufacture our funeral monuments right here in San Angelo. With a wide variety of materials and techniques available, we’ll make your idea a reality. Whether you would like a simple grave marker or an elaborate mausoleum, we have a product that will meet your needs without hurting your budget. Birk Monument also offers unique memorials such as benches and black stone etchings. You can speak with our design team to come up with the perfect monument for your loved one. Please call us today at 325-262-4810. We’re committed to providing you with high-quality work. We pay strict attention to detail with every monument we create. Please call or visit us soon.